The SDLP voted against renaming a play park named after an IRA hunger striker to "avoid stoking community tensions", it has said. 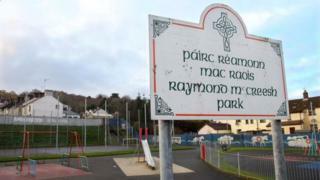 The party had promised it would support a move to change the name of Raymond McCreesh Park in Newry.. But, in a vote at Newry and Mourne District Council on Wednesday, the SDLP opted to take no immediate action. The naming of the County Down park after the IRA man has been controversial since it opened in 2001. McCreesh, from Camlough in south Armagh, was one of 10 IRA prisoners who died in a hunger strike in the Maze Prison in 1981. Last year the Equality Commission told the council it needed to review the park's name. On Wednesday, the council was given three options; rename the park, retain its name or leave the name in place until a review of all playgrounds is carried out. They voted for the third option. The SDLP and Sinn Fein voted 23 in favour of recommending a review of the use of the land, in partnership with the local community, while nine councillors voted to change the name, The News Letter reported. Gary Stokes, the SDLP's council group leader said the property would no longer be under council ownership in 2018, which would provide a solution to the dispute. But unionists argue the change in ownership will not alter the name. Mr Stokes said the party wanted to "avoid stoking community tensions". He told the BBC's Good Morning Ulster programme that allowing the park to be dealt with later was "an opportunity that wasn't available before". It was likely the park would be judged to be "surplus to requirements" and be handed over to the community, he added. UUP councillor David Taylor said the SDLP had "failed to heed the concerns of the victims of republican violence and those of the unionist community". He said there was a danger that the ground could be transferred to the local community, who could decide to keep the name. "It is inconceivable that in any civilised world that any portion of ground would be named after a convicted terrorist," said Mr Taylor.